The unincorporated community of Saucier, first settled 170 years ago (1848-2018), is located in Harrison County, Mississippi on highway 49 about twenty miles north of the city of Gulfport. The Pierre Phillip Saucier family, descendants of self exiled French Canadian Jean Baptiste Saucier and his wife Gabrielle Savory of Colonial Mobile, were the first settlers in the area known today as Saucier, Mississippi, settling there in the summer of 1848. Pierre Phillip Saucier, his second wife, Martha Ann Smith, and family of ten children from his first marriage moved northwest to the remote area of thick virgin pine forest after selling all his property in the Pass Christian and Delisle areas. Pierre Phillip Saucier and his family settled on several thousand acres of land he had purchased in the area at 25 cents an acre in the area known as Wortham, on the east side of the present day Saucier community. Pierre with the help of his older sons cleared the land and built their family home on a stream they named Saucier Creek after the family. His home was the only one for miles round. His older married sons soon established their homes nearby. Pierre made his living in the timber and logging business, farming, raising cattle, hogs and sheep as his sons continued to do in later years. The nearest established cities at the time Pierre settled the area of Saucier were the small towns of Pass Christian with a population of less than 800, Mississippi City which had a population of around 600 was the County Seat and the location of the Harrison County Court House, and Biloxi with a population of around 900 or more, all located in the coastal area. Gulfport was not established until 1898, two years after the town of Saucier was established, and did not exist in 1848 when Pierre Phillip Saucier moved his family to this northern wooded area of the county. It was a complete day's journey to reach the coastal cities which were located 25 to 30 miles from their home, with Pass Christian being the farthest distance, and required one or more nights lodging when making the trip from the village of Saucier by ox cart, horseback or wagon. The nearest town, McHenry, was established in 1889, over 50 years after Pierre settled the Saucier area and seven years before the town of Saucier was established, and was a flourishing saw mill town located five miles north of Saucier. Samuel Bernard Saucier (1835-1911), who went by the name of Bernard, was the tenth child and youngest son of Pierre Phillip Saucier (1798-1874) and first wife Isabel Nicaise (1800-1836). At the age of thirteen years, he moved northwest of Delisle with his father, step mother and siblings. Eventually, after marriage, Bernard settled, to the northwest of his father in the area he later officially named Saucier, Mississippi after his family. Samuel Bernard, a Catholic, married Martha Ann Moore (1842-1922), daughter of a Methodist Minister, Michael Moore and his wife Caroline Gordon, of Jasper County on January 1, 1862. Samuel Bernard was twenty-seven years old and Martha was twenty years old. Samuel Bernard lived with his older brother (Jean) Baptiste on his homestead where he helped on the farm, caring for the cattle and in logging operations before he married. He and Martha continued to live for a time after their marriage with his brother Baptiste Saucier on his homestead. Samuel Bernard and his wife later moved into a one room log cabin he built in 1863, south of his brother Baptiste, near where the town of Saucier stands. Later he built a large four room home of solid heart pine lumber milled from timber cut on his property. The home had long porches on the north and south sides. During the early years the front porch was often used as the area's barber shop and a dentist's office. As was the custom in that era, the kitchen and dining areas were built as separate buildings near the main house. Bernard and Martha raised a large family of nine children. The old home was destroyed by a fire on Sunday, October 6, 1935, about 4 o'clock in the evening. Samuel Bernard's son Talmadge Saucier and his family were occupying the home at that time and escaped with only the clothes on their backs. The old home was a total loss. For many years the Crape Myrtle trees and Roses planted by Martha Moore Saucier remained as a reminder of her at the site. Starting around 1855, the Saucier family, living to the north of Pass Christian, repeatedly made requests to the Catholic Church's Bishop in New Orleans for a Priest to come to the remote northern area of the county on a regular basis, to perform marriages, baptisms, funerals and general church services for their families and neighbors. During this time the families of the area would have a simple civil service for any marriages in the community. As soon as a priest was available to them, they repeated their marriage vows with the Priest in attendance and had their children baptized while the Priest was in their area. Sometimes their children were several years old before a Priest finally came to their area to baptize them and perform a church wedding for their parents. By 1873, like his father Pierre, Samuel Bernard had become a supporter of the Methodist Church after the Catholic Diocese of New Orleans was unable to send a priest to the area despite their many requests. Prior to the Catholic Church at Pass Christian, members of the Saucier family and members of other Catholic families in the area were married, baptized and buried by priests from St. Louis Cathedral at New Orleans who traveled for many days to reach the area by horseback or wagon. Priests seldom made the journey due to the distance from New Orleans. The only other Catholic Churches were located at Natchez and Mobile, even farther from them than that of New Orleans. In 1847 a priest had been sent to Bay St. Louis by the Natchez Diocese to establish a Catholic Parish and Church there, Our Lady of the Gulf, and services were held in different area homes until the church could be built. The lone priest of Our Lady of the Gulf Catholic Church served the entire area of Hancock County which then included what is now Harrison County, parts of Lamar and Stone Counties to the north. With such a large area, the Our Lady of the Gulf priest had more than he could handle. The church at Bay St. Louis was closer, but it was still a great distance, requiring two or more days travel time, one way, by buggy for those of the Catholic faith living in the Saucier area. The nearest Catholic Church, located at Pass Christian, was not built until 1872 and it was more than a full day's journey from their home, making it only an occasional visit made by family members. Children born into the family up until 1873 were all baptized as Catholics at New Orleans's St. Louis Cathedral and all those after 1873 were baptized as Methodists in local area churches. Not all the Saucier families during this period of time converted from their Catholic religion to the Methodist church, many maintained the old religious ways of their parents and ancestors and continued as parishioners of St. Louis Cathedral of New Orleans or became parishioners of the new Catholic Church at Pass Christian or at Bay St. Louis. After more than 167 years, the community of Saucier is still without a Catholic Church to serve its area, but has numerous churches of other denominations located within its borders. Samuel Bernard Saucier, like his father before him, purchased fifteen hundred acres of land for 25 cents an acre in the upper part of Harrison County between 1883 and 1895. At the time, raising sheep was the biggest industry in the area, followed by the fast growing timber industry and raising cattle. Samuel Bernard kept large herds of cattle and a large flock of sheep. Sheep raisers in the area carried or ferried their wool down the Biloxi River to Stigletts Ferry in Woolmarket, which is how that settlement obtained its name. The wool was sold at the market located there and then loaded on schooners to be shipped on to Mobile, New Orleans and elsewhere. In the future, with the coming of the railroad, sheep raisers in Saucier and surrounding areas were able to ship their wood by railcar to markets in the north instead of taking it to Woolmarket by boat or wagon. Pierre's third son, Jean Baptiste Saucier, called Baptiste by the family, after his marriage cleared land, settled and built his home in about 1850 near where the town of Saucier stands. During the late 1870's Baptiste moved his family north to Lamar County and a new homestead. After his uncle's move, Albert Bernard, the oldest son of Samuel Bernard bought his uncle Baptiste's homestead at Saucier and moved his family into the old home. 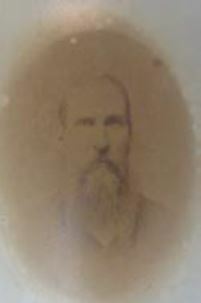 Baptiste died in 1900 at Purvis in Lamar County. Travelers from the northern part of the state traveling to the coast, before the railroad was established, would stop for the night at Samuel Bernard's home or at his father Phillip Pierre Saucier's home when passing through the village. There they found food, a place to stay overnight and care for their horses provided by the family. Sometimes regular frequent visitors passing through would bring back needed supplies from the coast for the family and sometimes a family member would join them on the trip to the coast. The town of Gulfport did not exist at this time, so those traveling to the coast for supplies would travel to Pass Christian, Mississippi City or Handsboro to make their purchases from the stores located in those settlements. When conducting legal business, family members would travel to Mississippi City where the County Court House was located. Family members making the trip would find housing for the night with friends or family, at a hotel or stay in a boarding house while conducting business and making purchases at the stores for their families. As more families settled in the village, many regular travelers would blow a horn to let the family and others know they were passing through, in case anyone wanted to join the caravan or needed supplies brought back from the coast. This was all to change with the coming of the railroad and faster transportation to and from Saucier by rail. In 1870, the United States Government sued Pierre Phillip Saucier, claiming he aided and abetted the enemy during the Civil War, possibly because he was a Confederate sympathizer, but, more likely because his sons and grandsons had supported and fought in the Confederate States Army against the Union Army. In the aftermath of the lawsuit, the government took one hundred and sixty acres of his land from him in its settlement and gave it to the Gulf and Ship Island Railroad. Shortly after that Pierre suffered a stroke. His third wife, Elizabeth Moore Ramsey, and her five daughters from her first marriage nursed and took care of him until his death four years later in 1874. Sometime after the death of Pierre Phillip in 1874, some of the children who had remained and settled around their father's homestead, began breaking up and selling sections of the land they had inherited from their father, some retaining their homes in the area and others, like (Jean) Baptiste, moving further to the northern part of the state with their families. The village, that was later to become the town of Saucier, had been originally founded as a saw mill town before the coming of the railroad. In the early years of the village, family members would float cut logs down Saucier Creek and the Biloxi River to the nearest saw mill where the logs were cut into lumber and sold or brought back for the families use. Eventually the family set up its own saw mill and cut its own lumber for the growing market. In the beginning the village of Saucier consisted mainly of Pierre Saucier's family members and those married to his children, all living on homesteads between Saucier Creek and the Biloxi River. Some of the families then comprising the village were Pierre's sons, Jean Baptiste Saucier, Samuel Bernard Saucier, Narcisse Edouard Saucier, Philippe Noel Saucier, Henri Severin Saucier and their respective families. Other residents were Sarden Byrd, Rufus Broadus, Ephraim Patton, and Rufus Bond and their families, all who had married one of Pierre Saucier's daughters and then made their homes in the village. Brothers Charlie and Oliver Saucier, who were Pierre's nephews, later moved to the village with their families. In the early years of the village, up to about 1898, there were only one or two additional families living in the village that had no direct relationship to the Saucier family. At first, Samuel Bernard wanted to name the new village, "Bernard, Mississippi", after himself. During the years 1890 to 1892 the area was actually called "Bernard Station". The Biloxi Herald referred to it as Bernard Station in its news articles during these early years. But after much prodding from family members, who wanted him to name the town "Saucier" after the family, reluctantly, he finally conceded and named the town "Saucier, Mississippi" in 1893. In the early 1890's, Samuel Bernard Saucier established the only post office north of Pass Christian. At first the post office was located in his home and he would ride a horse to McHenry, about five miles to the north, once a week to obtain the mail at the post office there and post the mail for the settlement. Once he built and opened the general store, he moved the post office from his home into the store. His oldest son, Albert Bernard, was then appointed as Postmaster on November 16, 1893 and Samuel Bernard was now able, officially, to name the new community "Saucier, Mississippi" after his family. On October 9, 1896, the younger brother of Albert Bernard, Lucius Washington Saucier, was appointed Postmaster, replacing his brother. 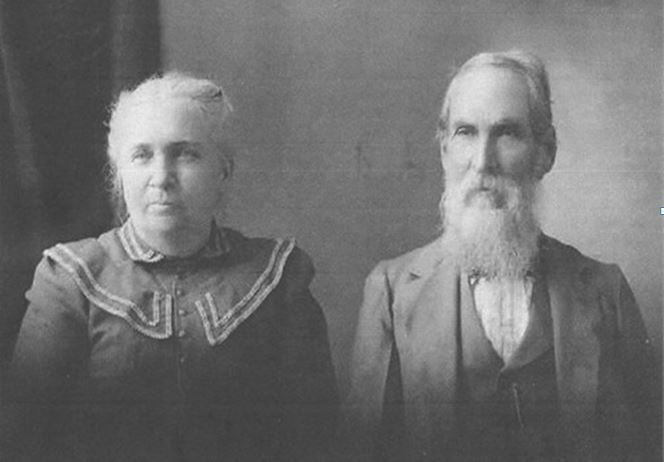 On April 13, 1900 Lucius' wife, Annelise Nolan Saucier replaced him as Postmaster, and Loren Saucier replaced her in 1904. This was a position to be held by different family members for many years. The last family member to be appointed Postmaster of Saucier was Ruby Mae Fickling in 1928. She was the granddaughter of Samuel Bernard Saucier, the towns founder and served four years as the towns Postmaster. During the late 1890’s, the Gulf and Ship Island Railroad was built through the middle of Samuel Bernard’s property. The building of the railroad became a favorite pastime for the Saucier children as they gathered to watch the workmen laying its rails through the village and building bridges across the creeks and rivers. The first stretch of the new railroad was completed and opened between the port at the future city of Gulfport to Saucier by mid 1894 and from Saucier to Hattiesburg on January 1, 1897. The new railroad was then completed from Hattiesburg to Jackson and that section opened on July 1, 1900. This sparked a rapid growth of the town. Bernard established the Bernard Saucier Lumber Company and a general store along the railroad by 1896; the railroad constructed its depot nearby. 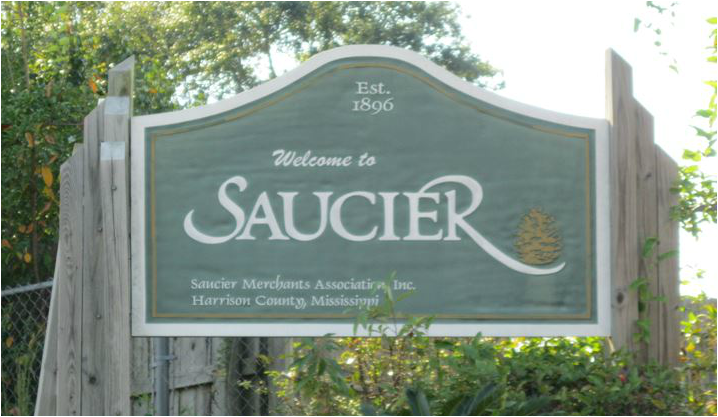 After the opening of the new store and post office, the railroad officials placed a sign reading "Saucier" on the front of its depot, officially recognizing the town. The store opened by Samuel Bernard, the Gulf Naval Stores turpentine distillery and the new Gulf and Ship Island Railroad depot were the first buildings in the new town. Shortly thereafter, a young doctor, Henry Hopper, moved into the town, opened his office, and later opened the town's first Drug Store. In 1900, Doctor W. E. Terry opened his office in the town of Saucier including his own Drug Store which now gave the town two Doctors and two Drug Stores. With the success and growth of their business ventures and the coming of the railroad the Saucier family and the town began to prosper. The General Store and lumber business started by Samuel Bernard, and the Naval Stores turpentine distillery that Royal L. Stewart opened, formed the nucleus of the prosperous town. The J. R. Nevers Lumber Company opened a large mill in town in 1899. They also built a company General Store and homes for their workers. The Nevers Lumber Company operated two locomotives and numerous flatbed rail cars that hauled logs along the Gulf and Ship Island railroad to its Saucier mill as did other lumber companies located there. The Nevers Lumber Company produced over 75,000 feet of lumber per day. The Nevers Lumber Company was sold in 1903 to the Elsemore Lumber Company of Alabama who operated it until 1905 when it was sold, shut down and then moved to another state. These businesses had been quickly followed by the Russell and Rouse Lumber Company's Mill, and the Strong River Lumber Company's mill in 1900. Strong River Lumber was soon followed by another large lumber mill, which built their own company General Store to serve their workers and numerous new homes for those workers. This gave employment to a large number of men who established their homes here and made the small town famous during this era. The railroad kept the new lumber mills busy with its huge orders for lumber, cross ties and timber for the bridges needed to build the expanding Gulf and Ship Island railroad within the state. It seemed the prosperity of the town would go on forever and never end. The Gulf and Ship Island Railroad which was responsible for the rapid growth of Saucier was also instrumental in the formation of the new Port of Gulfport in the early 1900's where the lumber from Saucier's mills was shipped out by schooner or steamer. The coming of the railroad brought an influx of additional families into Saucier and greatly increased the population of the small community, which was beginning to strain at its seams. This was only the beginning of the growth that the town would experience in the very near future. The trains stopped in Saucier to load and ship turpentine from the distilling plant, wool from local ranchers and lumber from the mills operating there. Almost all yellow pine lumber milled in Mississippi passed through Saucier. The families in the wool business shipped three or more boxcars of wool, in bales of 235 pounds each, from the Saucier depot on a weekly basis to mills in the north. With the success of the railroad and the timber industry, other businesses soon opened nearby. The new town of Saucier could now boast of having a hotel, several general merchandise stores, a restaurant, barber shop, livery stable, court house, jail, doctor's office, drug store, turpentine distillery, and additional new saw mills in operation. The two Saucier brothers, Charlie and Oliver Saucier, nephews of Pierre Phillip Saucier, moved into town, built their homes and then jointly opened a large general store, Saucier Brothers General Store, which they operated for many years. Saucier now served as a major stop for all passenger trains along the Gulf and Ship Island Railroad between Jackson and Gulfport for both passengers and freight. The moderate climate and friendly atmosphere of Saucier made it a bustling, prosperous and popular town during this period. From a population in 1900 of only thirty people, by 1901, the town’s growth was so rapid and so extensive, that it quickly reached the point where it was decided to incorporate the town to keep taverns out of the area, and liquor was not allowed to be sold within its boundaries and the State Sunday closing laws were upheld in the new community. The town was incorporated by Bernard on April 27, 1901 and the towns Charter of Municipality was issued by the state. Due to the state Sunday closing laws now being enforced a number of the town's merchants, including several members of the Saucier family, were arrested by the towns Marshal and fined $50 in the local Court for selling merchandise and liquor on Sundays as a result of that law. The town's welfare was looked after by a Mayor and Board of Aldermen. Royal L. Stewart, owner of the Naval Store, was elected as its first Mayor. Royal L. Stewart served the town as Mayor and chief executive for its first eight years, many times sitting in the judgment seat to pass upon the guilt or innocence of a defendant brought before him. Ernest E. O'Neal, owner of Ernest E. O'Neal's Dry Goods Store was elected the towns Mayor, serving for two terms after Royal L. Stewart, who had also served for two terms. N. W. Cowart was elected and served a term as Mayor after Ernest E. O'Neal. Lloyd W. Lott was later elected and served as town Marshal until his resignation on December 4, 1914 and Paul Collins also served as deputy, Marshal and Tax Collector. Leonard T. Fickling, husband of Theodosia Saucier and son-in-law of Samuel Bernard, served under Paul Collins as Deputy Tax Collector until he was elected as the towns Tax Collector in 1916. The newspapers of the coast and of McHenry were continually reporting on the activities of the citizens, happenings within the town, its businesses, events being held by its churches and its school's activities. The Biloxi Daily Herald had a regular section for news from Saucier and its surrounding areas written by local newspaper reporters. During the early years of the town, a large one room building located near the Saucier cemetery served as the town's school house and was also used for church services, town meetings and other functions. 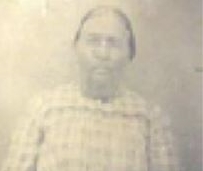 Miss Pauline Laurence was the school mistress of the one room school for a number of years, having come from Pass Christian and the Pineville area to the community to teach the Saucier students. In 1903, Samuel Bernard Saucier donated land and lumber for the building of the Saucier Methodist Episcopal Church. But for some unknown reason, Samuel Bernard retained ownership of half the property, deeding only the portion of land the church was constructed upon. His wife, Martha upon her death, in 1922, left the remaining section of land to the church in her will. 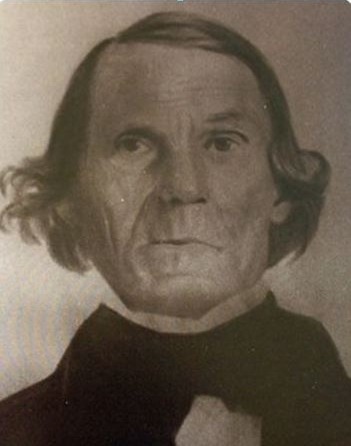 Samuel Bernard, a staunch advocate of education, also gave land and money for the creation of the Saucier Boarding High School, and land for the Saucier Cemetery. New churches were opened during this period, giving Saucier additional churches to serve its growing population. 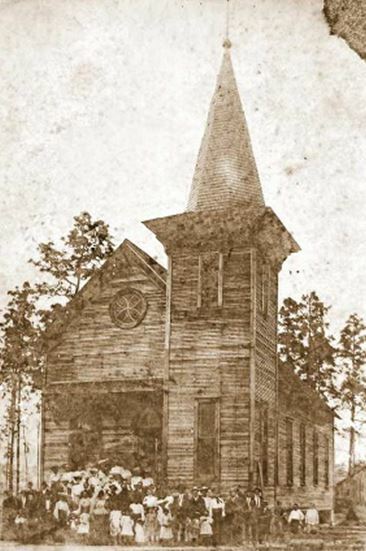 In this same time period in many communities surrounding Saucier other family members established Methodist churches for their own family's attendance with traveling circuit horseback riding or carriage traveling ministers holding rotating services in the area churches. In 1904, the town of Saucier was much larger than the town that exists today. Saucier was a very prosperous community having several large lumber mills that contributed to the prosperity of the town and its people. In addition to Bernard Saucier's General Merchandise Store, four other large stores, Saucier Brothers Mercantile Store, Ernest E. O'Neal's Dry Goods Store, which operated in Saucier until 1948 when it was sold to Ernest Yeager and Sons Stores and continued operation under that ownership for the next twenty-five or more years, M. H. Rouse's General Store, J. W. Wonkley's General Store, G. W. Jordan's Confectionary Store and Belle Butler's Restaurant were located in its thriving business area. Additional stores later operating within the town were Icham Reeves' General Store, Lucius W. Saucier's General Store, and Royal L. Stewart's General Store and Lumber yard. Also during this time an additional turpentine distillery was put in operation called the Stewart-Smith Turpentine Company. This now gave the town of Saucier two operating Turpentine distilleries. The new Saucier Boarding High School was completed and opened in 1904. Samuel Bernard, with the help of several other businessmen in Saucier created the boarding school, which included a dormitory for boys and one for girls. The land upon which it was constructed was donated and deeded by Bernard to the County Supervisors in January of 1890 for the construction of the town's school. Trustees for the school listed on the Supervisors minutes on the docket when they accepted the deed were Samuel Bernard Saucier, Oliver L. Saucier and William S. Scarborough. The school was privately operated in its first years of operation. In a statement given in the 1960's, Earl Nolan Saucier said his grandfather, Samuel Bernard, always gave regular financial support on a monthly basis to the school; along with several of the town's businessmen. The first principal of the Saucier Boarding School when it first opened was twenty-six year old H. A. Wood, assisted by his wife, Holly Wood. Three teachers, Nannie Wood, Maggie Walker and Roberta O'Neal assisted H. A. Wood and his wife during the first years the new school was opened. In 1905, Principal E. B. Baldridge and his wife supervised the Saucier High School and dormitories personally. For the 1905/1906 school year there were over 100 students enrolled and 11 students living in the dormitories. 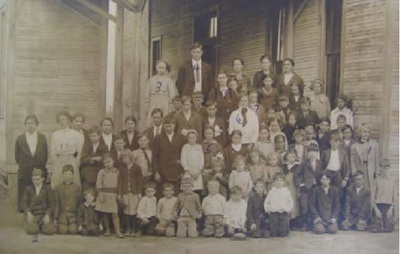 Students came from throughout the county to attend school at Saucier. They offered a diverse curriculum for the time, including a variety of foreign languages, sciences, literature and cultural studies. They offered a variety of activities including sporting activities. The school was quite advanced for a town of Saucier’s size. The old original Saucier school building including the large auditorium and library, built in 1905, was destroyed by a fire in 1984. A new modern school was later built to replace it and still operates today. In 1907, the State of Mississippi adopted prohibition, which meant Saucier no longer had to worry about taverns locating in the area, which was one of the reasons it had originally incorporated in its effort to keep them out of the town. ​In February of 1908, Charles R. Saucier and his wife Eran Breland Saucier, along with Charles' brother, Oliver Saucier, who together owned and operated the Saucier Brothers Mercantile Store, opened the Star Lumber Company and Mill at Saucier which was one of the last mills to close in the early 1920's, managing to stay in business after the lumber business had collapsed in 1918. In its prime it produced 45,000 feet of lumber daily. ​In 1911, another mill, the Lott and Perkins Mill owned by Pine Lumber Exporters, was moved to and opened on the outskirts of Saucier, where it employed numerous Saucier citizens, and produced 60,000 feet of lumber daily until it was finally closed in 1923. Pine Lumber was owned by George H. Hovey and N. M. McInnis of Saucier who had purchased and moved the Lott and Perkins mill to the outskirts of the town of Saucier. Pine Lumber which was located about two miles south of Saucier operated with 2 locomotives and 16 flatbed rail cars in its logging operations to transfer logs to its mill along its own rail line that connected to the main line of the Gulf and Ship Island Railroad. In about 1912 The Lott and Perkins Mill's name was changed to the Pine Lumber Company and the area where the mill was located was designated as Hovey, Mississippi, named after George H. Hovey. Although it was never incorporated into a town as Saucier was 11 years earlier, it eventually had two mills, Pine Lumber Company and the smaller Blair Lumber Company operating there until they were both closed in 1923 following the collapse of the lumber industry. In June of 1912, the Bank of McHenry started proceedings to foreclose on unpaid loans to the Saucier High School for $674.60, plus $21.95 interest and court costs, owed by the School. Charles R. Saucier, who also held unpaid loans of the school, joined the legal proceedings and foreclosed on the loan he was holding for an additional $637.90 plus $5.95 interest and court costs. The Harrison County Sheriff held a sale on the steps of the Gulfport Court House to sell the building, land and all improvements. The School, still having on-going classes, was sold to the highest bidder on November 3, 1913 for the huge sum, in that day, of $1,312.50 plus $27.90 interest and court costs to satisfy the liens. The purchaser was Percy H. White, a realtor of Gulfport. Within the next month he met with the citizens of the town of Saucier to make arrangements to sell the School House back to them. According to accounts of a meeting on December 9, 1913, with town officials, Mr. White offered to sell the school property back to the town for $100.00 cash and a balance due of $200.00 to be paid on December 14, 1914. It was stated by the town's mayor and board of aldermen that a special election and vote would be held to determine whether the town should make the purchase and increase the town's indebtedness. The special vote would be scheduled and held by E. T. Saucier, N. W. Coward and J. B. Brewer, the town's election commissioners. The vote was held on December 18, 1913 and passed by voters. Mr. White it seems sold the property back to the town at a considerable loss, as his original investment was $1,312.50. During all this, never a day of school was missed. In later years, due to the decline of the timber industry which greatly reduced the town's income, town officials, after a meeting of the Mayor and the board of aldermen, it was decided to have a vote on whether or not to un-incorporate Saucier. The town's election commission, consisting of J. B. Brewer, W. N. Wood and R. R. Broadus made arrangements for the citizens of Saucier to vote on the issue at W. N. Wood's Mercantile Company. On March 26, 1918, the town of Saucier held an election to determine whether to remain a municipality or surrender its charter and revert to a village. The town’s vote was, sadly, in favor of surrendering its charter to the state. On June 5, 1918, a final meeting and vote of the town council was held to conclude its affairs and to finalize the town’s demise. The town ended with a surplus of money in its bank accounts. As its final action, the town council earmarked this ending balance of funds for the school’s use. The next day the town’s Charter of Municipality was surrendered at the County Court House in neighboring Gulfport. Saucier now officially ceased to be a town. The town of Saucier, its Charter of Municipality being issued in 1901 was a young town of only 17 years at the time it surrendered its charter in 1918. On February 9, 1921 the Harry Company Mill at Saucier finally shut down, laying off about 150 men. Saucier merchants were trying to make, and hoping, arrangements could be made to keep the mill open for another year or so, but were unable to do so. Most available timber in the area had been cut and the forest depleted, with only enough work remaining for a few months. The railroad tie cutters were now all out of work as there was no longer a demand for additional ties. Many local companies had large stocks of ties which they could not sell and were trying to rid themselves of their large inventories through other means as the Gulf and Ship Island Railroad was now out of money and no longer making timber purchases. The timber industry at Saucier was now at a complete standstill. With the closing of the Star Lumber Company owned and operated by brothers Charles and Oliver Saucier in 1924, the era of the timber industry in Saucier had officially ended. In the course of time the thick pine forests had been recklessly cut and denuded, the lumber mills were closed, dismantled and moved away. The Naval Stores plant then ceased its turpentine distillery operations. To the dismay of its citizens, the town had seen the demise of the pine forest and its lumber industry. The loss of the timber business caused a huge economic slowdown and hardship for the town. The industry had ceased to be a financial support for the town and its citizens and the different businesses located there gradually began to close. In the pioneering spirit that built the town, Saucier continued its fight to remain alive and continue to grow. During this time of transition, farms were developed as the mills were closed and dismantled and moved to other states. After the heads of the different closed businesses moved away, the town of Saucier just barely managed to remain on the map. Farmers diversified their crops and the fields that had been covered in grass for so long were put back into use. The town suffered a large loss of population during this time of change. Saucier gradually became a farming community, growing cotton, planting cucumbers for its new pickle canning factory, and other food crops for the local and regional market. In the early 1920's, due to the increased demand for charcoal in New Orleans, Chicago and other cities throughout the nation, Ernest E. O'Neal, who owned the E. E. O'Neal Mercantile Store, expanded his operations in Saucier to now include the making of charcoal on a large scale and built several large kilns to burn charcoal for the huge New Orleans market. Several other remaining Saucier businessmen soon followed, including Knox Ramsay, who built numerous kilns to burn charcoal for the Chicago market and other cities in the north. For a few years charcoal burning became a big business for the town and numerous boxcar loads were shipped out weekly from Saucier to New Orleans, Chicago and other cities. The charcoal business, which gave work to many men of the town, like the failed timber business, was not enough to support the workers or for the town to survive. The charcoal kilns were soon shut down and abandoned. Even with all its problems during its early years as a town, its population has continually grown over the years. Nothing remains today of the sites of the mills, the distillery or the other early businesses that made it a bustling town in the early 1900’s. Only the memories of its past exist today to remind us of what had once been a vibrant bustling town. In the early 1950's a reminder of the heyday of the lumber mills, several huge sawdust mounds could be seen on the west side of the highway when driving along the highway through Saucier. Today, these mounds no longer exist. During World War II, the community of Saucier, Mississippi again made headlines when it was selected as a satellite Prisoner of War Camp site, a branch of the main camp located at Camp Shelby in Hattiesburg. During WWII, German and Italian Prisoners of War captured in Africa were shipped across the Atlantic to America where it was cheaper to house them. In 1943, a POW camp was constructed in the pine woods in the eastern section of Saucier. Once the POW's starting arriving they were housed in the camp there and worked in forestry, planting saplings and clearing land. Prisoners from the Saucier camp were also contracted out by the War Department to work for the Dantzler Lumber Company at their mill in Perkinston, Mississippi to stack, load and handle lumber at the mill. They worked 8 3/4 hour work days which did not include the hour they got for lunch and their work day could not exceed 12 hours per day which included travel time from the POW camp to the work site and back to camp. Most did not leave the camp until late 1947, four years after arriving at Saucier, Mississippi. In early 1946 several prisoners escaped from the Saucier camp and were captured in Gulfport and returned. Parts of the old camp's remains, the concrete ammunition storage bunkers, are still visible there today. Over the years a number of the former German Prisoners of War have returned to visit the old POW camp sites they lived in during their time as prisoners and were surprised and sad to learn the camps they lived in as young men were torn down after the war. An interesting side note to Saucier being used for the German Prisoners during WWII is a newspaper report in the Biloxi Herald that on April 30, 1917 during WWI about the sheriff capturing a genuine German spy at Saucier who had important papers, maps of the Gulf and Ship Island Railroad and other railroads, along with important area drawings in his possession. He was turned over to Federal Officials at Biloxi. A follow up to the story was run a week after the initial story. It seems according to the Biloxi Herald Newspaper that the genuine German spy was identified several days later by a Gulfport businessman as a longtime Gulfport resident who was deaf and dumb. Since it turned out to be a case of mistaken identity the man was released by the Federal Officials. No explanation as to the maps and other papers found on him were mentioned in the second article. Today, Saucier, Mississippi is a modern thriving semi-rural area of about 1,300 people, and covers a total of seven square miles of land with numerous small businesses, new homes and sub-divisions, still not incorporated, just outside the city limits of Gulfport, Mississippi. Numerous descendants of Pierre Phillip Saucier and Isabelle Nicaise still reside in the area of Saucier, Mississippi, and the surrounding areas of the coast and into the northern parts of the state. As for the future of the community of Saucier, Mississippi, it seems to be perched on the brink of possibly being annexed by the city of Gulfport in the very near future. This has been the fate of its four sister towns, Landon, Nugent, Orange Grove and Lyman, Mississippi. The only possible solution for the survival of the community of Saucier would be for the citizens to band together and once again incorporate Saucier into a full fledged city of the coast, which seems unlikely to happen in the near future. The town of Saucier, which grew so quickly in the early 1900’s will just fade into the city of Gulfport and become a lost memory of the prosperous little town it once was. The year 2018 marked the 122nd anniversary year (1896-2018) for the town of Saucier. The photo above to the left is of Pierre Phillip Saucier who with his sons settled the Saucier and Wortham areas in 1848. The middle photo is that of his son Samuel Bernard Saucier who was the founder of the town of Saucier, Mississippi. The final right photo is that of Martha Ann Moore Saucier, the wife of Samuel Bernard Saucier. The photo above on the left is a later photo of Samuel Bernard and Martha Ann Moore Saucier and the photo on the right is of the students and facility of the Saucier High School in 1914. The school was established by Samuel Bernard Saucier and opened in 1904. The pictures above are of the original Saucier Methodist Episcopal Church building. In 1903, Samuel Bernard Saucier donated land and lumber for the building of the Saucier Methodist Episcopal Church. But for some unknown reason, Samuel Bernard retained ownership of half the property the church was constructed upon. His wife, Martha upon her death, in 1922, left the remaining section of land to the church in her will. "The History of Saucier, Mississippi"